This unit comes with a WHITE base. 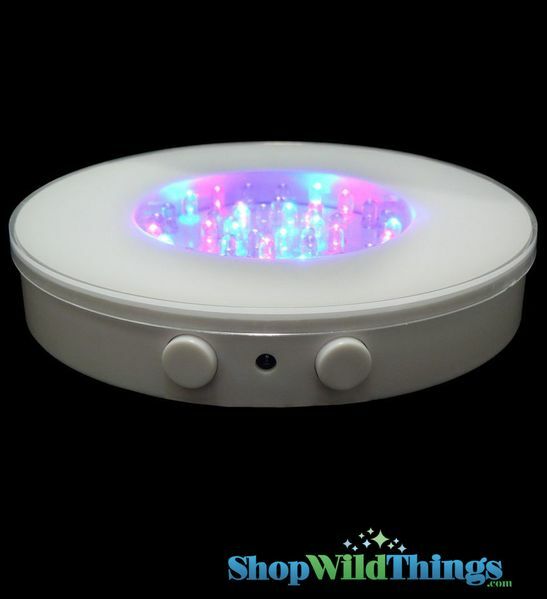 Our awesome Super Bright LED Light Base offers several color changing options as well as a "white only" option! 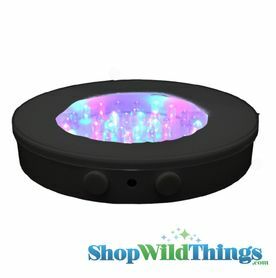 This 6" Diameter base has an acrylic top over the lighting which provides a level and solid display surface. There are 10 LED lights in each color: red, blue, green, and white. Let the colors rotate automatically or pause on any color. You'll get 5 color changing modes. Each fresh set of AA Batteries (uses 3 batteries, not included) will last for 15+ hours. LED bulbs will last for thousands of hours. You can also use a 4.5V DC adapter (not included). This light base is fantastic for uplighting your floral Decor, vases of any kind, liquor bottles, awards, food displays, and more! 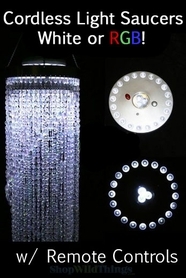 You can also DOWNLIGHT chandeliers hung at an event! Also available with BLACK base. The Lighted area of the base is 3.25" in diameter. The entire diameter of the whole base is 6". So far the light works well. It's fairly lightweight yet holds up well under a heavy glass ball. I wish there were more color options and that it came with a power cord...I'd be happy to pay extra for the latter. But for the price I can't complain. It's nice and bright and I like that I have the option for a single color/brightness or rotating fade. Works well with the vase I bought it for. ProsMulticolored, pause feature, just the right size for my needs. ConsMaybe the batteries will run down? Not sure, I haven't used it much yet. I needed a light to fit under a fake crystal ball for an event. I went through a couple cheap lights either didn't work, weren't bright enough or broke within 15 minutes. This light is perfect. Sturdy, well-made, easy to use and BRIGHT. I bought two and have been very pleased with them.